Today MQSeries offers the programmer more choices than ever in which to write new MQSeries applications, from the most traditional Message Queue Interface API all the way through to the popular and highly portable JMS interface. Because of the many options available, it can sometimes be difficult for an application programmer new to MQSeries to easily understand the differences and benefits of each, or appreciate the implications of using one programming approach versus another. This IBM Redbooks publication will help you install, tailor and configure specialist tools such as JMS admin, and will help you to design/create MQSeries applications. It gives a broad and general understanding of the currently available MQSeries APIs. We do this first by describing some of the more common examples and coding patterns, and then explaining each one in turn using the different APIs MQSeries supports to show the merits of each particular programming choice. 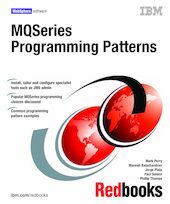 This book positions the different MQSeries programming choices against each other in such a way as to help the application writer to make a clearer and more informed judgment as to which is the most suitable programming method for a particular situation.